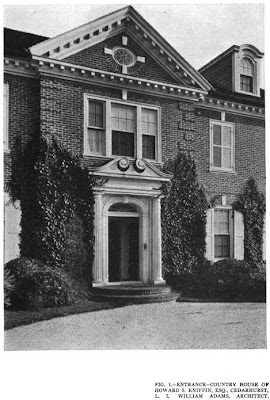 The residence of Howard Summers Kniffin, designed by William Adams c. 1911 in Cedarhurst. Kniffin was senior member of the firm Kniffin & Caffrey, hemp and jute brokers. Click HERE to see the Kniffin residence on google earth. 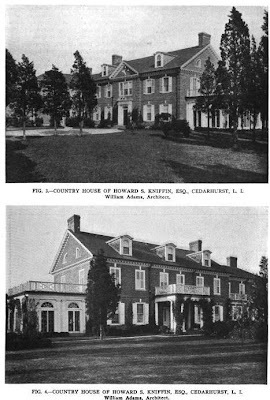 Pictures from Architectural Record, 1918. I know Kniffin's granddaughter. 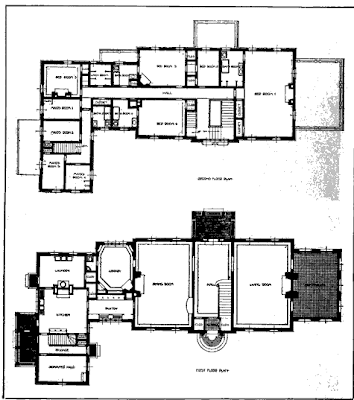 Will check on house's present state. Great grand daughter? It seems H.S.K. died in 1929. His son had the same name though (passed away in 1980). Howard Kniffin, would be about 65 today. He went to the Lawrence Private school. At 19 years old he owned an "Indian 900" motorcycle and disassembled it in his garage and then reassembled it just to say he could. I think he moved to San Francisco and became a postal worker. This is either the grandson or Great Grandson of the Howard Kniffin here.